There’s a lot to love about the Northern Territory – not least the amazing weather, relaxed lifestyle and sense of community. As the local name in LPG, Kleenheat heads north to meet the people and see the places that makes the NT a great place to live. Few people would spend more time on the road across the Northern Territory than Shane Hinds. For 24 years, Shane’s truck has been hauling Kleenheat LPG across the Northern Territory and north-west Western Australia – from Darwin to Tennant Creek and across the Kimberley – making sure commercial, industrial and residential customers have their LPG needs met. Each time Shane pulls out from Kleenheat’s depot on Channel Island to begin his journey, he knows it’s just him and the road for the coming days – but he’s got plenty of good company waiting at each and every stop along the way. “A lot of the customers are like good friends these days, so I really enjoy the interaction” he says. Across local Darwin neighbourhoods, Earl Richardson is quickly becoming a familiar face around town. Each day his domestic LPG cylinder deliveries help local households keep baths hot, dinners cooked and houses warm – always with a smile and a wave along the way. Customers may not always be home when their cylinders arrive, but with some simple information placed in the letterbox they know the hard work’s done and their gas is safe, ready and waiting. “Because we’re dealing with such a dangerous product, we have to be very conscious of our safety,” Earl says. Away from the home, there’s also a consistent community feel underpinning the drive and success of local businesses making a splash locally and across the country. For example, if there’s one thing Barry Albrecht knows it’s mangoes. As the owner of Arnhem Mangoes, he keeps four orchards fruiting year on year to place around 180,000 trays of mangoes on supermarket shelves right across Australia. 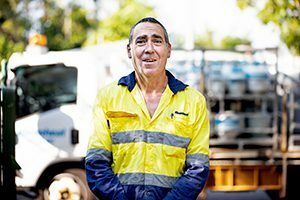 In the growing season, when the humidity gets a little higher, his gas heater on the drying tunnel helps keep the mangoes rolling – fuelling Barry’s life passion. “I’ve been able to do this so long because of the motivation I’ve got growing mangoes,” Barry says. Speaking of life’s passions, the Darwin Sailing Club’s Waterfront Bistro has been pleasing palates for more than 20 years, all thanks to one family’s passion for food. Today, local chef Tommy Jong is whipping up flavours to excite, but it was his mother and her six brothers who first decided to combine great food with a great view – entertaining locals and out-of-towners in equal measures. It’s a similar story for Lisa Heams of Besser Kitchen & Brew Bar in Winnellie, who’s food dream led her and two friends to turn their passion into everyday life. Having grown up in Darwin and gaining experience in hospitality, it’s their love for delivering great experiences – and an appreciation of the local weather and lifestyle – that keeps the coffees pouring. Kleenheat’s proud to be the local name in LPG across the Northern Territory and Western Australia, with success built on delivering reliable service and support, developing new relationships and strengthening existing ones. Our LPG network delivers more places more often thanks our dedicated team of drivers – and a reliable local dealer network – committed to offering the best possible value, reliable service and support, with an unwavering commitment to safety.